From Left: Cesar and Celia Veloso, Mary Jane's parents. Netizens unanimously react on Mary Jane Veloso's mother, Celia, when she denied claims that the government saved her daughter's life from execution. 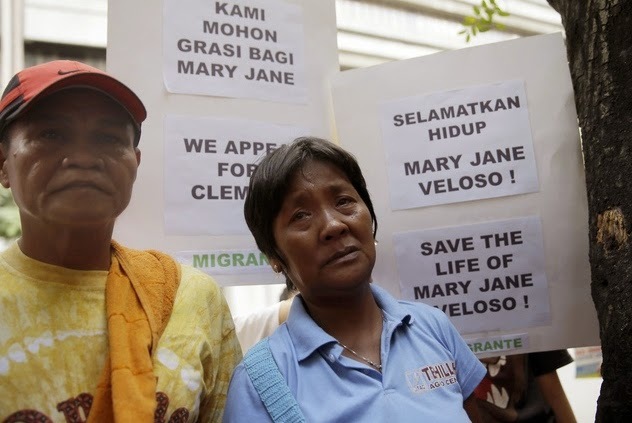 Mary Jane is a migrant worker convicted for drug trafficking in Indonesia and was granted a temporary reprieve from execution last Wednesday while the remaining eight other convicts were executed. It was indeed a miracle. Almost everyone knows that the Aquino government did everything that they could to save 30-year-old Mary Jane from Indonesia's death row. It was even reported that PNoy 'broke protocol' in his last minute phone call to Indonesian Foreign Minister Retno Marsudi by suggesting that Mary Jane can be turned into a state witness. Indonesian Attorney General H. M. Prasetyo was also quoted saying Veloso's execution was delayed "because there was a last-minute plea from the Philippine president." Celia also added that the Aquino administration has been fooling them, "Sinabi niya na ibinabalita na niya sa buong mundo na sa kanya nanggaling ang pagkabuhay ng anak ko kaya nakaligtas sa bitay, hindi po totoo 'yun," she said. "Kaya humanda kayo ngayon, nandito kami para lumaban sa inyo, haharapin namin kayo." Speaking to reporters, Aquino answered back by saying "We did what we could. We were not involved in the creation of the problem. You must remember she was arrested, if I am not mistaken, April of 2010."